Credit: Archivo General de Indias. Ministerio de Educación, Cultura y Deporte, Gobierno de España. Researchers from the Higher Technical School of Engineering (ETSI) of the University of Seville have published a study of a series of hand-drawn maps that copied the maps printed in the first days of Hispano-American cartography. From the start of the colonisation of America, the Spanish Crown needed to know and represent the overseas territories under its control and within its territorial borders. In the last third of the sixteenth century, the instrument that was designed to carry out the project to represent the new world was the use of surveys. This great project is known as the 'Relaciones Geográficas de Indias'. The local authorities had to answer questions about geography, topography, toponomy, resources, etc. In addition, they had to draw up a map of the region or a "painting" that graphically described the geography of the region, indicating the geographical features, local population and routes of communication. Among these documents, the researchers have found a set of maps that are characterised by a peculiar style, as they try to imitate the style of maps that were drawn up in Europe in this period. These maps follow an inverse trend to that which can be observed in the first printed maps, which tried to imitate the style of hand-drawn maps. After searching in the Archivo General de Indias (General Archive of the Indies) in Seville and in the Benson Latin American Collection at the University of Texas, in which they found a total of seven maps, a descriptive study of the maps has been published which shows that all were done using a quill pen, that they come from different geographical areas, and that they were done in the period 1579-1580. "Looking at the documents that we found, it seems that the authors of these maps held the printed documents in such high esteem that they put more effort into reproducing the characteristics of printed maps than in describing the geography of the regions that their maps represented. 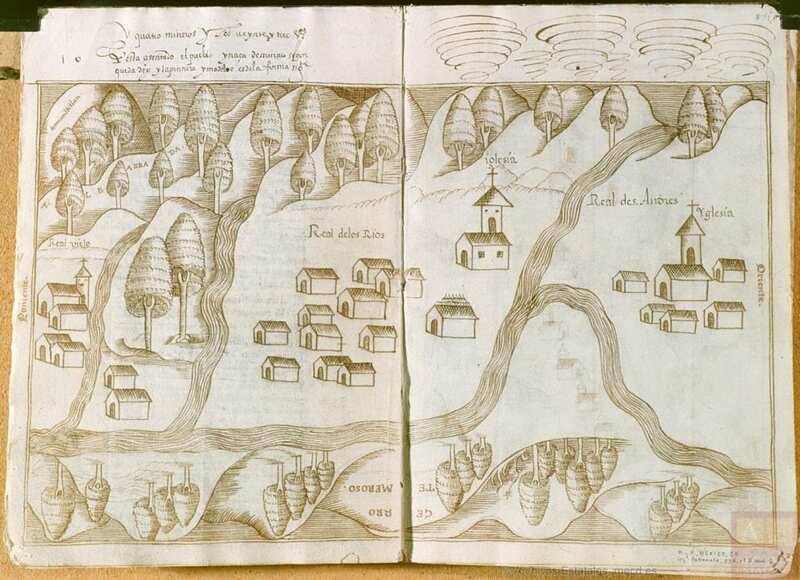 That is to say, they did not imitate the art of the maps, but the prints on landscapes that the books illustrated, images that they would have known given the wide availability that these books had in Central America, as well as Europe, in the 16th century", indicates the University of Seville teacher Manuel Morato. Although all the maps were done in the European style, they also show some characteristics that suggest the influence of indigenous cartography, like footprints on the routes and eddies in the rivers, in which fish can also be seen on the surface of the water. Having these indigenous conventions in coexistence with European cartographic characteristics suggests an effort to adapt the two cartographic styles to each other. "The authors of these maps might have unconsciously mixed European and native conventions", the researcher adds. In addition, the experts have identified the influence of another renaissance practice which originated in the portolan charts: drawings of figurative scenes of indigenous people and animals of the region, like deer, rabbits, vultures and armadillos. "Possibly the disproportionate representation of these animals is a way of emphasising the animal species that were characteristic of the region, or, as in the case of the armadillo, highlighting those exotic species that were unknown in Spain". Faced with these clues, it might be that the maps that were studied were the result of the desire of their authors to achieve a cartographic ideal: the aesthetic of printed maps. They are a hybrid product, as they not only show influences of maps carved in wood, but also printed maps like those used as illustrations in books: furthermore, they also contain other conventions taken from indigenous traditions, as well as pre-renaissance European practices.